Despite being a standout high school athlete, players from Eatonville in that era rarely got the exposure that would bring the attention of major colleges and universities. Jones’ only college scholarship offer when he graduated from high school in 1956 came from all-black South Carolina State University. While attending SCSU Jones became a star football player. He also became involved in early civil rights activities. which resulted in his scholarship being rescinded in 1958. Jones returned to football in 1960 when a former SCSU coach brought him and other former SCSU players to Mississippi Vocational College (now Mississippi Valley State University). There Jones drew the attention of NFL scouts. Jones left the Rams at the end of the 1971 season, and from 1973 to 1974 he played with the San Diego Chargers. He finished his career in 1974 as a Washington Redskin. Jones was inducted into the Pro Football Hall of Fame in 1980, and was named to the NFL’s 75th anniversary all-time squad in 1994. In 1996 Jones released his autobiography, Headslap: The Life and Times of Deacon Jones. The following year he launched the Deacon Jones Foundation, which works to provide opportunities for children from inner cities. 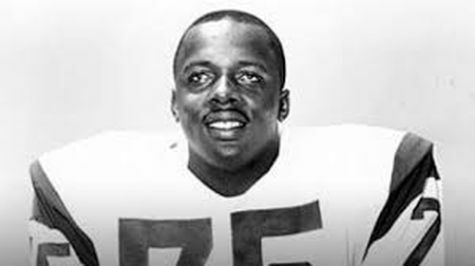 David “Deacon” Jones died on June 3, 2013, at the age of 74, in Anaheim Hills, California. He was survived by his wife, Elizabeth, and stepson, Greg Pinto. David “Deacon” Jones, Headslap: The Life and Times of Deacon Jones (New York: Prometheus Books, 1996); http://www.biography.com/people/david-deacon-jones-21248105; http://espn.go.com/nfl/story/_/id/10232374/robert-mathis-indianapolis-colts-wins-deacon-jones-award; http://www.deaconjones.com/ssp/about_deacon.